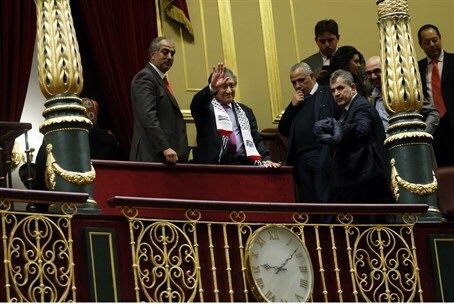 EU Parliament to vote Thursday to recognize Palestinian state. Israeli ambassador warns if yes, Israel will view EU vote as anti-Israeli. Following Sweden's official decision and symbolic votes in the United Kingdom, Ireland and Spain, the European Parliament is expected to vote on a draft resolution that wold recognize a Palestinian state. The parliaments of France and Denmark are also slated to hold a similar vote in the next few days. Proponents of the initiative were the Progressive Alliance of Socialists and Democrats (S&D) and the Unified European Left Party (GUE). After Sweden decided to recognize the State of Palestine, the president of the Social Democrats declared that it was the only solution to ending the conflict in a way that would benefit both parties. He added that the EU should be more involved in the peace process and must recognize Israel and "Palestine" as two states living side by side. He said that French faction in European Parliament was pushing for recognition of a Palestinian state as well. Senior European parliament members explained that the decision to proceed with this vote results from increasing frustration in Europe for what they dub Israel's disregard for European protests about the expansion of settlements. The motion is expected to come to a vote by the full European Parliament in Strasbourg, France on Thursday November 27. The GUE's draft “urges all EU member states … to recognize the State of Palestine on the basis of the 1967 borders with Jerusalem as the capital." However, Parliament offered softer versions of the motion, such as "the European Parliament calls for EU countries to adopt a unified position on the subject of the recognition of Palestine." Israeli Ambassador to the European Union David Walzer and member of the delegation have been holding urgent meetings with political consultants and members of the European Parliament. Walzer discussed the current situation of radical Muslim terrorist organizations in the region, spurring a religious conflict which allows no room for compromise and concessions. Walzer, also mentioned that meeting between US Secretary of State John Kerry, Israeli Prime Minister Binyamin Netanyahu, and King Abdullah II of Jordan, noting that Israel takes responsibility and tries to keep the public calm, which cannot be said of the other side. He stressed that the unilateral recognition of a Palestinian state would not help bring Netanyahu and Palestinian Authority Chairman Mahmoud Abbas to the negotiating table but only push the two sides to distant corners. Walzer warned that if the European Parliament does recognize Palestine as a state Israel will view "Europe's decision as anti-Israel."